Energy Trust staff and board of directors tours energy-efficient upgrades at Klamath Works. 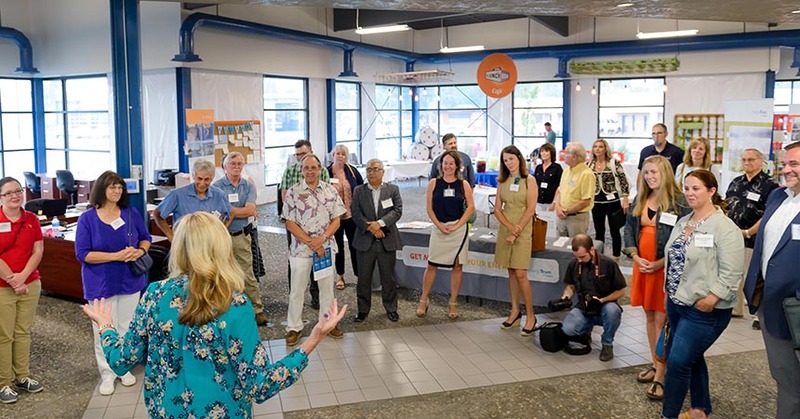 Several Klamath area businesses, news media, Pacific Power and Avista utility partners, and community members joined Energy Trust in July at its monthly board of directors meeting, held at the Oregon Tech (OIT) campus in Klamath Falls. In addition to discussing its regular business agenda, board members were treated to a presentation by Oregon Tech President Nagi G. Naganathan and introduced to several members of his faculty and administration. President Naganathan shared an overview of efforts well underway to position Oregon Tech as a world-class technology institution, including in fields such as renewable energy engineering. Prior to the board meeting, board members also had an opportunity to see three customer sites where Energy Trust has provided incentives and technical resources. One site was Klamath Works, which helps people gain skills and resources, to prepare them for work. During a tour of this impressive new campus, board members heard from Joy McInnis at Klamath Works who described its mission and work in the region. Ms. McInnis also discussed its work with Energy Trust on a variety of energy efficiency projects, including lighting improvements, which stand to save Klamath Works on its utility bills each year. Board members also received a tour of Klamath Falls Gospel Mission, a new construction project located next to Klamath Works, that will house and counsel the homeless. At this community space, Kent Barry provided an overview of the project and also of the solar array they are implementing with support by Energy Trust and others. Additionally, Sky Lakes Medical Center Facilities Management Director Rick McGuffey provided a tour of the energy efficiency projects completed at Sky Lakes Medical Center. He also showed the board the newly installed solar array. Sky Lakes is the area’s most prominent care facility, serving more than 80,000 residents in Klamath and Lake Counties and Northern California. Before the board meeting, Oregon Tech’s Thom Darrah, director of facilities management, offered board members a tour of Cornett Hall. During the tour he described a variety of lighting upgrades to this facility on the Oregon Tech campus. New shop space will increase lab and study space capacity for students, and includes daylighting features and an innovative strong wall for testing materials. Since Energy Trust began serving customers of Pacific Power in 2002 and Avista in 2017, together we have helped nearly 11,000 homes and businesses save or generate energy in Klamath County alone, from Malin to Chiloquin. Thanks to 49 local contractors, retailers and installers, Klamath County homeowners, renters, ranchers, farmers, nonprofits, tribes and businesses who made these upgrades and have saved significantly on their utility bills. “That’s money that stays in their pocketbooks, on their balance sheets, and in Klamath Falls,” concluded Roger Hamilton.